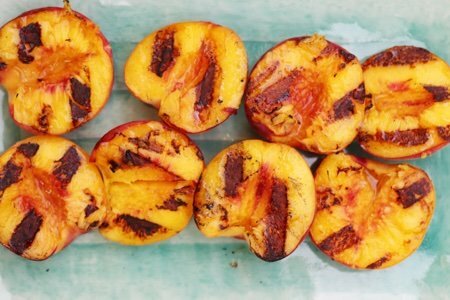 This grilled peaches recipe is all you need. The “naked” part is that you can serve them without any toppings (don’t grill naked)! Chez Panisse, a very expensive restaurant in Berkeley, California, famously served a naked peach as dessert. There are peaches that don’t need any adulteration to be the absolute perfect, sweet food. 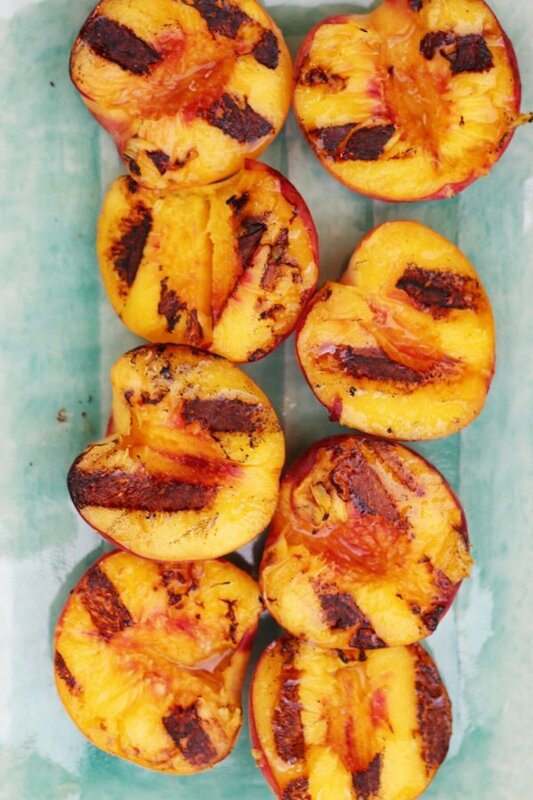 Grilling peaches can make them even more perfect (if that is possible). I have been grilling healthy food all summer. Check out my how to cook vegetables on the grill post and my and how to grill watermelon post to help you move past hamburgers and hot dogs. I make sure my grill is clean from whatever else I have been grilling. I heat the grill for about 10 minutes on high and then I scrub it with a ball of aluminum foil using tongs. 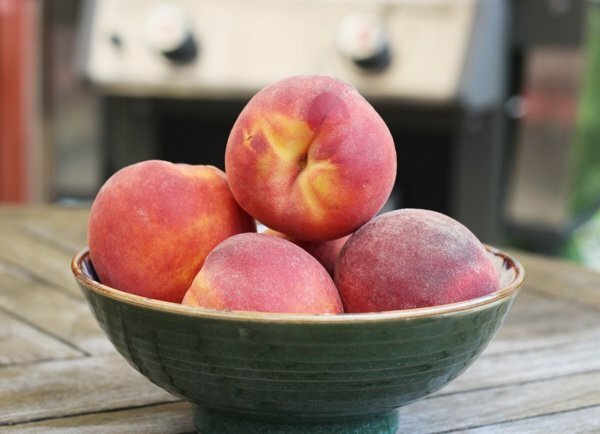 I toss the peaches on and my family waits impatiently – “Peaches done yet?”. Sometimes, I used these as a side for whatever else I am grilling and they work with savory food. Also, I refrigerate them and eat them with yogurt for breakfast (if they make it that long). I have found flats of peaches at Trader Joe’s and Costco and I don’t hesitate to buy them. If you can’t eat them fast enough, put them in the fridge so that they ripen more slowly. Heat a grill on high for 10 minutes and clean with a ball of aluminum foil to take off any residue. Cut peaches in half and remove pits. Place peach flat side down and grill on medium high for 3 minutes. 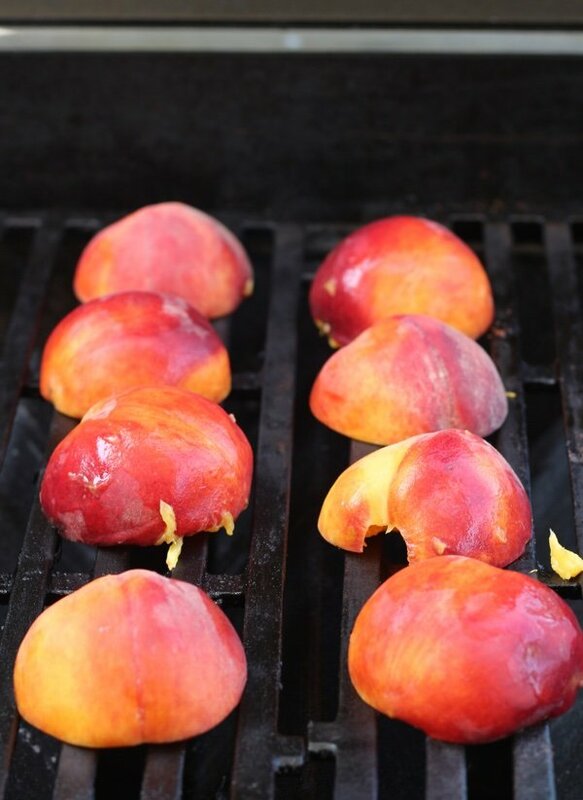 Flip over and grill for another 2-3 minutes until peach is hot. Enjoy immediately! 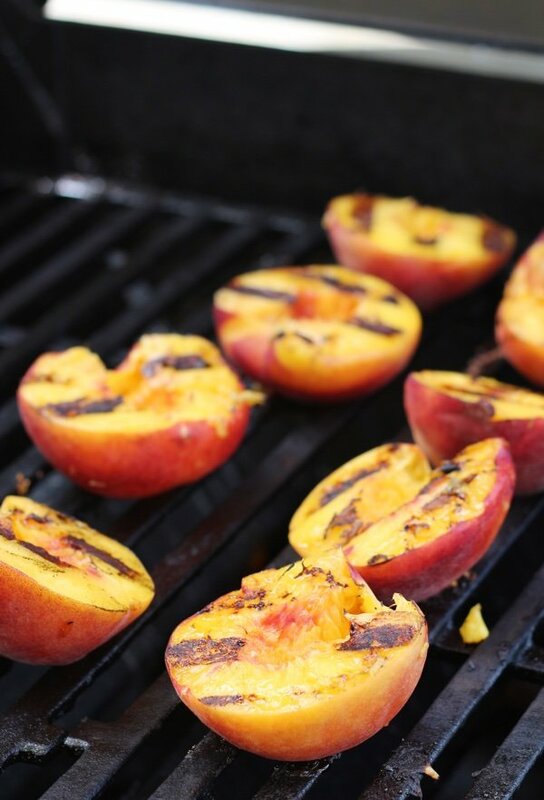 I love grilled peaches too and serve them along side grilled meats. In the morning however, I enjoy my peach cooked in the microwave. I slice the peach in half, remove the pit, place it in a bowl, and then micrwave it on high for 15 seconds or up to a minute, depending on the size of the peach and weather I'm having a half or the whole peach. A few blueberries sprinkled along is quite nice also. A dollop of plain greek yogurt & a sprinkle of granola... yum! Never tried to grill them before and Karen, I like your idea. Will definitely try both. This looks fantastic! I can't wait to try them. I too lived in Athens, Georgia, for several years (master's from UGA), and have vivid memories of picking AMAZING peaches with my roommates. We ate so many while we were picking we were stuffed for the rest of the day. I've been a huge peach fan ever since. Peaches are one of my very favorites - such that I grow them in my backyard. I also microwave them, add a little bit of splenda brown sugar and I'm in heaven! Thanks for the grill idea. Looks good, but here up north, it's darn hard to find good, sweet, juicy peaches. So when we can get them, I just want them plain, fresh, with juice running down your chin when you eat them. The ones I've found in the stores here so far are hard as wood, and half as tasty. I agree with Kevin - here in Michigan all the peaches arrive in the stores/markets like rocks. Literally hard as a rock - I suppose that's for shipping purposes...but even if you take them home and allow them to ripen - they are pulpy and dry...hard to get a decent peach here. I have however, had some luck at Costco - when they have the white peaches...sometimes I hit them right and they're delicious...but that's only 'sometimes'...other times not so good...but we keep trying! Thanks for the tip on ways to use them WHEN we happen to get a good batch. They're also super delicious with a small scoop of vanilla ice cream!